Live in Florida. Do not have known termites. However, Pulled up carpet in house that we just purchased and have hairline cracks in the rooms. Can Termidor SC liquid be applied in those cracks as a preventive before the rooms are tiled. Will it harm the people who are going to be tiling the rooms. Could a tape be put over the cracks after application if product is safe to use inside. I cannot get thru to Termidor Company on line but was told here it was great to use then after I bought the bottle the first think I noticed was do not use inside. My intent is to use this product around the entire house after inside work is complete. I paid $100 for the 20 oz bottle and now see that it is almost half on line so I will be ordering online in the future. Hi RoseMary. Termidor is designed to be used either on soil around the outer perimeter of the home (trench and treat) or used inside of wall voids either as a spray or as a foam (with foaming agent and foaming sprayer or Termidor Foam Can). As far as being safe to use indoors, yes. 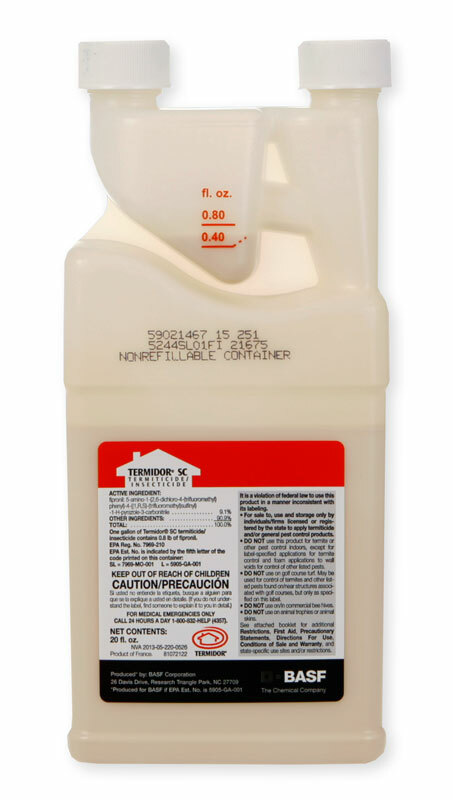 Termidor can be used inside of walls, in crawl spaces, etc. As far as applying to cracks in slab? Termidor SC doesn't exactly have that application on it label or directions - as it is designed to be applied to soil "under the slab" and not into the slab or cement directly. If there is enough space to allow the Termidor to saturate through the crack into the soil, then absolutely, I would recommend this. But if you are only going to spray the cracks, hairline cracks, and they don't have enough gap to allow the Termidor to soak through, then forget it. It isn't worth the time or the chemical to do this, because it won't be accomplisheing anything. You are better off just treating the outdoor perimeter as a preventive, and maybe any nearby plumbing entrances such as bathtraps, water lines etc, that are close to the crack. We have the best deals on Termidor!